Dempsey Vantrease and Follis PLLC is an established and well known accounting and CPA firm in Murfreesboro and Lebanon, Tenn.
With over 40 years in the business, Dempsey Vantrease & Follis has a firm grasp on the Middle Tennessee market, but they wanted to continue increasing market share for services such as personal tax preparation, business bookkeeping and business consulting. Dempsey Vantrease & Follis hired Adams + Swann to assist with yearly advertising campaigns in multiple markets, digital marketing such as SEO and social media management along with website development. 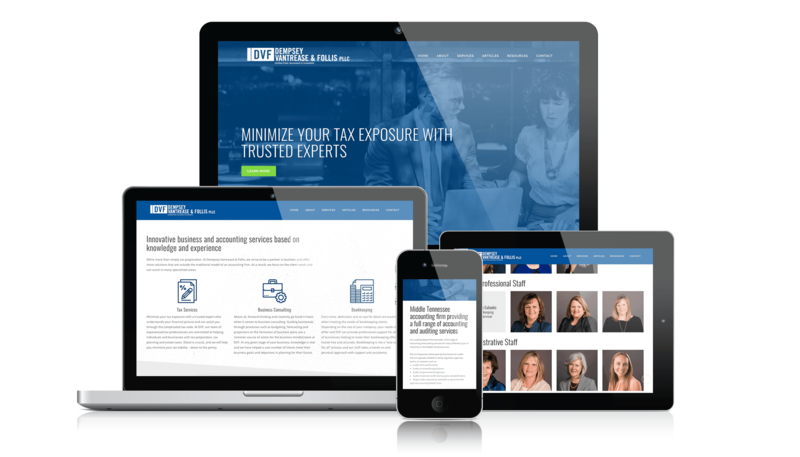 Adams + Swann developed a new website that will further assist Dempsey Vantrease & Follis clients in finding tax and financial services for which they are searching. By utilizing contemporary design aesthetics, custom photography and a new color palette, Adams + Swann developed a great resource for education, lead generation and resource gathering. Adams + Swann developed multiple tax campaigns which reach their peak during the high point of the tax season. 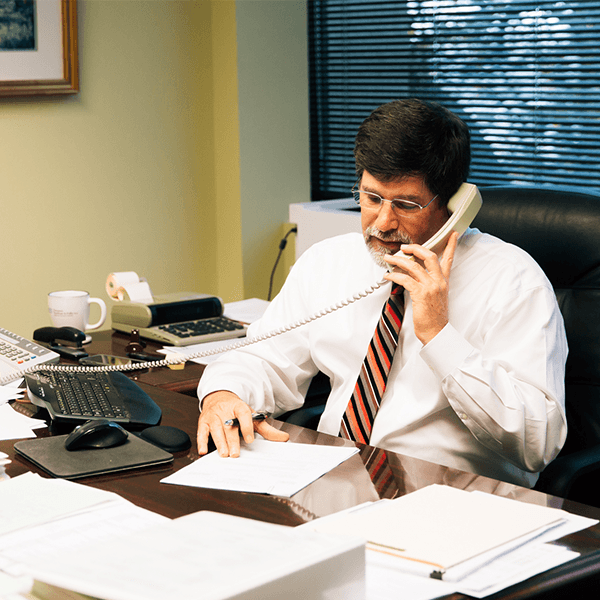 The accounting firm works aggressively within the current tax code to minimize tax exposure for high worth and high income clients. 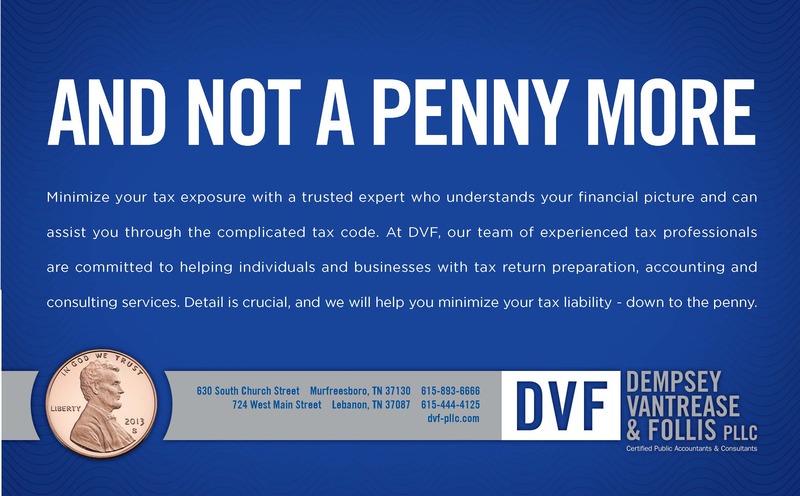 When developing a consistent ad strategy, Adams + Swann used the iconic image of a penny to convey this message in a multi-year campaign that states DVF will work “Down to the Penny” on client tax returns. This ad was used within social media along with regional print print publications. 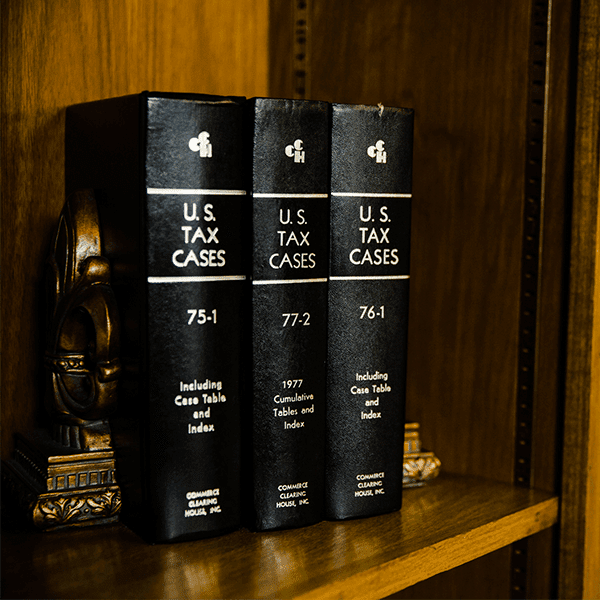 Seasonal campaigns on social media included tax services in the first quarter, tax education in the second quarter, and business tax services in the third and fourth quarter as businesses prepare for the end of they year. Adams + Swann used a mix of custom infographics, photography and content marketing in order to educate and assist current and future clients of DVF. Adams + Swann has increased search rankings and visibility online through dedicated SEO practices. By conducting research on top level keywords and phrases and paring it with relevant copy on the Dempsey Vantrease & Follis website, Adams + Swann not only produced a content-rich resource, but also upped the level of a pivotal piece of the digital marketing landscape. 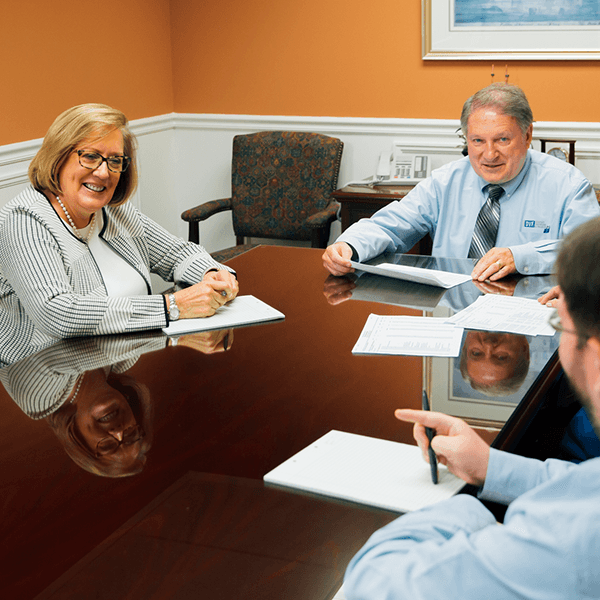 Each tax season, Adams + Swann employs multiple Google Ad campaigns to draw new leads and potential clients to the website to find information, schedule appointments and have their tax preparation executed by the Dempsey Vantrease & Follis accounting and tax team. Custom images are essential to many campaigns. In a visual world, photography is a major player and will give prospective clients a true snapshot of a company and its operations. When developing a new website, photography sessions included new headshots for the staff and also a series of images which captured the atmosphere and day-to-day life within the office.